CHARLESTON, S.C. — A few protesters gathered in historic Charleston to jokingly welcome Gov. Rick Perry into the race for president — of the Confederacy. In the state that was the first to secede before the U.S. Civil War and in the city where the first shots of that conflict were fired, protesters dressed in Confederate garb poked fun at Perry's controversial remarks, made two years ago, about the possibility that modern-day Texas could exit the federal union. Carrying signs that said "Secede NOW!" 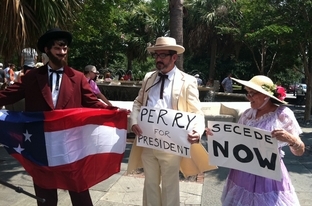 and "Perry for President," the protesters joked that they had been waiting for more than a century for a secessionist to get into the race. "As president he can secede the whole country from the union," said one of the protesters, who declined to give his name. The organizer of the protest, Lachlan McIntosh, said he put together the satirical "rally" to highlight the Texas governor's comments on secession and his strong advocacy of states rights. Protesters, dressed in Confederate garb, stage satirical rally in Charleston, South Carolina outside Red State event where Gov. Perry announced his presidential candidacy. "Over the years, Perry has made several statements that seem to advocate that Texas should secede from the union again," said McIntosh, director of a Democrat-aligned group called SC Forward Progress, which is aimed at countering "right wing extremism." McIntosh said Perry's advocacy of states' rights was used as a "battle cry for original secession advocates in the 1860s and then again by those opposing the civil rights movement in the 1960's." McIntosh found some irony in the choice of venue for Perry's presidential announcement. South Carolina became the first state to secede from the United States in 1861, and Charleston is where the secession order was signed. Perry has said he never advocated secession and never will. Across the street from the tiny protest, Perry said during his announcement speech Saturday in the Francis Marion Hotel that he was an "incredibly proud American." "America is not broken," he said. "Washington, D.C., is broken! "CHARLESTON, S.C. — A few protesters gathered in historic Charleston to jokingly welcome Gov. Rick Perry into the race for president — of the Confederacy. "America is not broken," he said. "Washington, D.C., is broken!"